The search for missing rock star Richey James has been stepped up since the Welsh guitarist's car was found abandoned at Severn View service station. James, the 27-year-old and lyric writer of the Manic Street Preachers, has been missing for nearly three weeks despite appeals from his family to get in touch. With a history of depression, James was treated last summer at a private clinic for problems including alcoholism and anorexia. His family and friends in Blackwood, Gwent, where he grew up, and in Cardiff, where he has a flat, are obviously worried about his safety. His father, Graham Edwards of Blackwood, said, "We are completely in the dark - we have no idea where he is. We are all worried about him and are appealing for him to get in touch with us." 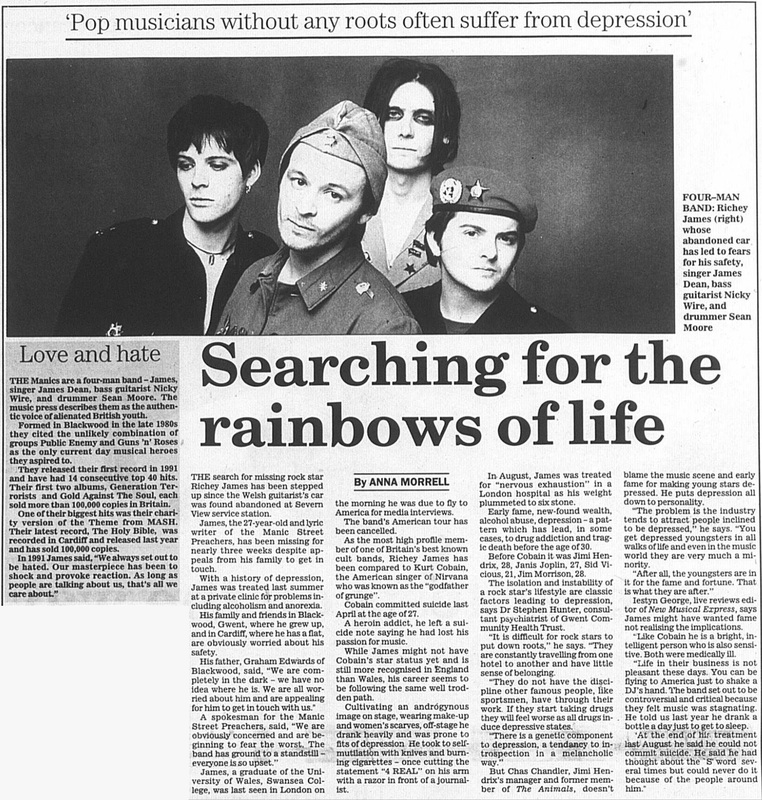 A spokesman for the Manic Street Preachers, said, "We are obviously concerned and are beginning to fear the worst. The band has ground to a standstill - everyone is so upset." James, a graduate of the University of Wales, Swansea College, was last seen in London on the morning he was due to fly to America for media interviews. The band's American tour has been cancelled. As the most high profile member of one of Britain's best known cult bands, Richey James has been compared to Kurt Cobain, the American singer of Nirvana who was known as the "godfather of grunge". Cobain committed suicide last April at the age of 27. A heroin addict, he left a suicide note saying he had lost his passion for music. While James might not have Cobain's star status yet and is still more recognised in England than Wales, his career seems to be following the same well trodden path. Cultivating an androgynous image on stage, wearing make-up and women's scarves, off-stage he drank heavily and was prone to fits of depression. He took to self mutilation with knives and burning cigarettes - once cutting the statement "4 REAL" on his arm with a razor in front of a journalist. In August, James was treated for "nervous exhaustion" in a London hospital as his weight plummeted to six stone. Early fame, new-found wealth, alcohol abuse, depression - a pattern which has lead, in some cases, to drug addiction and tragic death before the age of 30. Before Cobain it was Jimi Hendrix, 28, Janis Joplin, 27, Sid Vicious, 21, Jim Morrison, 28. The isolation and instability of a rock star's lifestyle are classic factors leading to depression, says Dr Stephen Hunter, consultant psychiatrist of Gwent Community Health Trust. "It is difficult for rock stars to put down roots," he says. "They are constantly travelling from one hotel to another and have little sense of belonging. "They do not have the discipline other famous people, like sportsmen, have through their work. If they start taking drugs they will feel worse as all drugs induce depressive states. There is a genetic component to depression, a tendancy to introspection in a melancholic way." But Chas Chandler, Jimi Hendrix's manager and former member of The Animals, doesn't blame the music scene and early fame for making young stars depressed. He puts depression down to personality. "The problem is the industry tends to attract people inclined to be depressed," he says. You get depressed youngsters in all walks of life and even in the music world they are very much a minority. After all the youngsters are in it for the fame and fortune. That is what they are after." Iestyn George, live reviews editor of New Musical Express, said James might have wanted fame not realising the implications. "Like Cobain he is a bright, intelligent person who is also sensitive. Both were medically ill. Life in their business is not pleasant these days. You can be flying to America just to shake a DJ's hand. The band set out to be controversial and critical because they felt music was stagnating. He told us last year he drank bottle a day just to get to sleep. "At the end of his treatment last August he said he could not commit suicide. He said he had thought about th 'S' word several times but could never do it because of the people around him." This page was last modified on 15 May 2018, at 09:38.